This weekend when we were puttering in the shop, Stephen and I chatted about some ongoing projects. It is a rare occasion that we are both in the woodshop at the same time because of the size and layout, combined with the fact that about 1/3 of our area is currently being used for storage and work-in-progress. In addition, when we are both in there creating, usually there are power tools that preclude much conversation. This weekend we found ourselves both working on projects at the same time AND both using hand tools, which got us talking about that and other benefits of using more traditional tools. 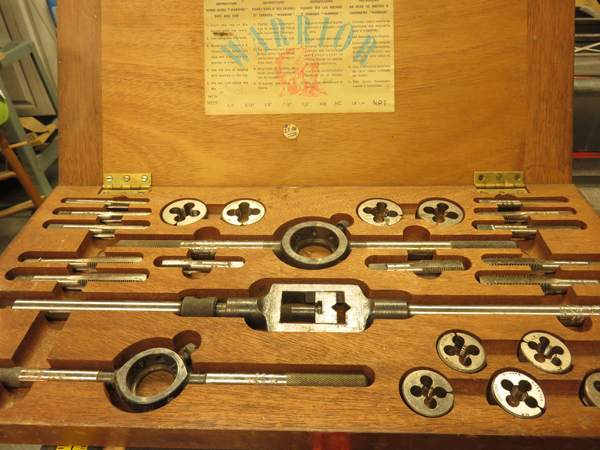 Stephen mentioned that he had recently had another chance to use the tap and die set that he got from my father some years ago when helping Dad with some cleaning. Dad offered us some tools he said that he no longer used, correctly assuming that we would give them a good home in our then brand new workshop. Stephen repeated how much he enjoys when he uses those tools. 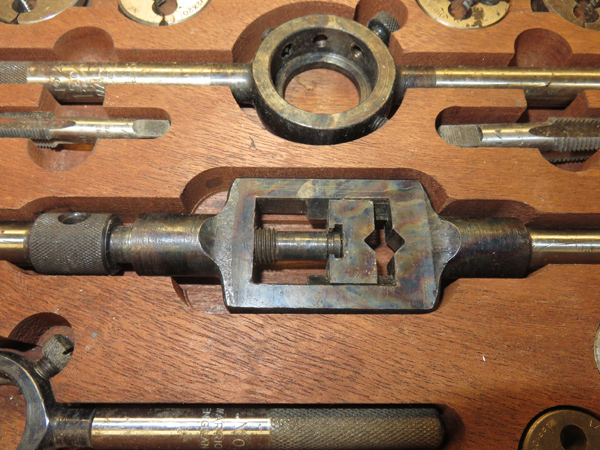 In the case of the tap and die the set is sturdier and more accurate than a much newer set he has from Canadian Tire but the newer set uses basically the same design. Personally, I think the older one looks much more attractive too. 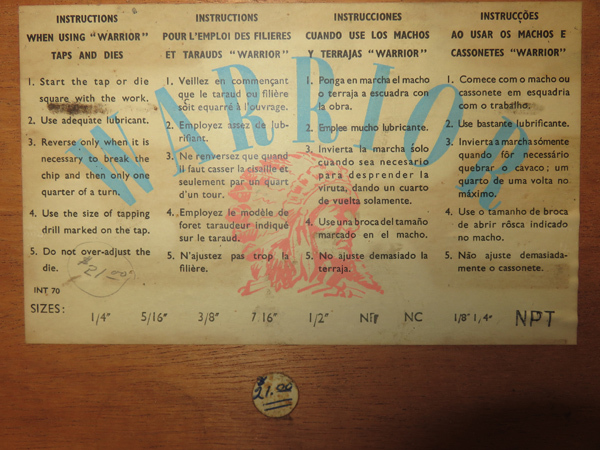 A tag in the lid shows Dad paid $21 for the set. Unfortuntely, I have no idea when he bought it. I am sure that it saw lots of use. As I prepared to write my Tech Tuesday, post today our conversation from a few days ago came back to me and I started thinking about traditional technology. Take the versatile hand plane, which has been around in various iterations for thousands of years. Did you know that ancient Egyptians are said to have used some form of scraping tools believed to be simple planes? Or that craftsman developed bronze and iron planes during the Roman Empire? The basic form has been familiar for hundreds, if not thousands of years. Pretty impressive, right? Of course, there have been refinements to allow ease of use or more flexibility. Early planes were made from wood with slot for a cutting blade iron was held in place with a wooden wedge. The size of the cutting surface was adjusted by tapping the blade into place. Some of our collection of old planes, including a rabbeting plane (front) Stephen bought for me online. Cool, eh? Later metal replaced wood and newer controls allowed much finer adjustment. This led to mass produced planes. In recent years, there has been a move away from mass produced planes to tools with more customization. 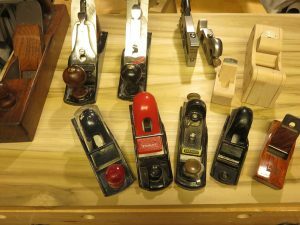 This has led to a wide and growing array of speciality planes from very tiny palm planes to popular block planes and larger jointers planes. I would venture to say that most serious woodworkers have a collection of planes in their tool box. We certainly do. 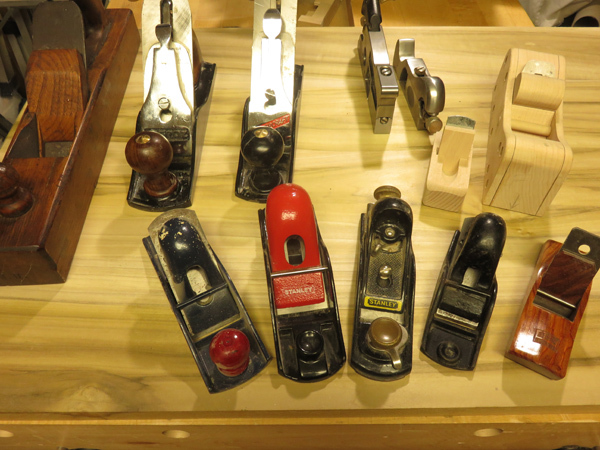 The Renaissance Woodworker blogs about using hand tools and writes often about hand planing. 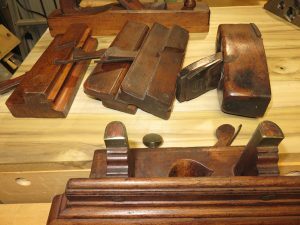 If you prefer watching a video, you might like Understanding Handplanes on the Lie-Nielson Toolworks channel or How to use Hand Planes from the Homestead Heritage School of Woodworking channel. Both of these channels offer many other informative and interesting hand tool resources. For my money, the traditional technology of a hand plane is worth celebrating. Hand planes are beautiful to use and often a work of art in their own right. Both sharpening and using the humble plane take some skill and practise. It can be frustrating to learn the technique and develop a rhythm and there are always things ways to improve. The effort is worth it though. Using a properly tuned and sharpened plane can be one of the most satisfying experiences in the woodshop. When you master hand planing it can take you to a zen-like state of peace and contemplation. By don’t take my word for it. Dig out an old favourite or a new plane and give it a try. It is my preferred form of meditation. Namesti.